Most energy experts in the federal government involved with contingency planning concern themselves with what to do when or if "the balloon goes up"; i.e., after the nation's 6-million-barrel-per-day oil supply is substantially cut off. Forum - Energy Security: Is the Past Prologue? 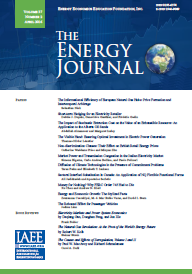 Published in Volume 3, Number 2 of The Quarterly Journal of the IAEE's Energy Economics Education Foundation.